This is not a news report, the only facts I know are what I saw myself and heard from others talking about the news in town last night. It’s simply my own experience and personal perspective. I first heard the news about the horrific car accident from my drawing students as they were showing up for class yesterday evening, some of them having driven past the scene of the accident only moments after it happened on their way to class. I still can’t confirm for sure if there was more than one fatality, but it sounds like just one. One insultingly tragic, unbelievably gruesome fatality of a young Jacmelien man, aged 29 who worked as a motorcycle taxi driver and was just crossing the street after buying some parts for his motorcycle when the vehicle came speeding towards him, and then through him. I will not go into the graphic nature of what some of my students were describing of what they had seen at the site of the accident out of reverence to the deceased who deserves to be remembered as more than body parts strewn on the pavement. The vehicle responsible for the accident belonged to a certain government authority, or perhaps even candidate in the upcoming elections. Again, I’ve already heard varied reports on that even from official sources, but it definitely was the vehicle of someone in public office. It occurred on the main road that goes through Jacmel in the area of St. Cyr which is near the airport on the way out of town. One after another I heard accounts as students came in to the class. “Bonswa,” someone would greet another. “There was an accident!” would be their response. So by the end of class everyone was aware of what was going on and searching for more information. We hear about traffic accidents here all of the time, even fatal ones, but because of the extreme nature of this one and the profile of the vehicle involved, it was suddenly becoming more interesting than all of the rest. It seemed much less like an honest accident and much more like a blatant disregard for human life. After class I carried on and went on to eat dinner at a local restaurant with a friend and driver of mine, Kenson who had come with me from Mizak. As we ate, the next door neighbors had their radio tuned to the news of the event in which they interviewed a cousin of the victim’s who spoke of the young man with much respect and sorrow over his loss. But he also alluded to the justice that his family and friends would surely be seeking. And anytime Haitians decide to seek justice for themselves, we know what that means. It was later on our way home from dropping off a painting to a customer in Cyvadier that we encountered the first roadblock. As we approached there was a group of men shouting in the road as they piled more rocks on a pile already about two feet high stretching the width of the road so no one could make it past. A couple of the guys started putting tires on top. We sat there at the front of the traffic that had started piling up as most started turning around and heading the other direction. Kenson kept the motor running for a while seeming to expect to still find a way around the barricade. One tall man who was putting large rocks on the pile was yelling about the body of the victim of the car accident today and how the people of Jacmel were being treated like animals. I told Kenson we could just go back and stay the night with my friends in Cyvadier but he stopped the motor and got off saying, “Just let me go talk to them. Explain to them that we’re not from around here and we need to get home to LaVallee.” I shook my head, thinking it absurd to try to reason with an angry mob, but he had made up his mind, so I waited. In situations like this I always like my friends’ belief that somehow my foreignness and their hillbilly nature will get us a free pass to safety. I always just think that the tall white guy in a crowd makes an easier target once the rocks start flying. And shortly after Kenson walked up and started to talk to the guys making the road block, everyone around heard the first rock fly and people scattered. He came running back towards me, holding his jeans as he ran so they wouldn’t fall down, as a man behind him came out from the side of the road with a bottle of alcohol lit on fire and he dropped it on the tires as others threw other junk on the pile to burn. As the flames spread across the street, Kenson jumped on the moto and grabbed a kid who was there and told him to lead us on a different route around the barricade. So the kid ran along side us taking us back on the tiny paths through the neighborhood until we could get back out on the main road on the other side of the barricade. We handed the kid 50 gourdes and headed on our way. We had to do this three more times along the road as we came upon more flaming roadblocks and had to search for interior paths around the danger. By the time we made it into the main part of the city, the road was clear the rest of the way and we were able to make it home. I hadn’t even noticed through it all that it had been raining and we were wet now as we drove out of town and up into the mountains. As I rode back up home in the light rain and cold air, I thought about a conversation I had had just a couple days before with a young college aged man from New York who was visiting for the week. We were walking along the same main road in Cyvadier that would be blocked and burning a couple days later when something in our conversation led him to ask, “Haiti, so what’s up with all the violence, really?” My friend Kara was with us as well who is an experienced nonprofit manager here and long time member of the Jacmel community. She and I both gave our views on the history of Haitians being a group of people that doesn’t put up with injustice and is always ready to fight back against authority figures and power structures that try to keep them down. They’re a group of people that are always ready to rise up. Yet at the same time it is sad to see them get to a place where they also all too often use that revolutionary spirit that’s inside them to act out against one another and cause violence to the Haitian brothers and sisters. Kara and I both shared stories of close friends of ours that have been injured by flying rocks and even brutally murdered, often in situations that simply get so out of control and descend into violence because that’s the response that’s been culturally demonstrated to them. 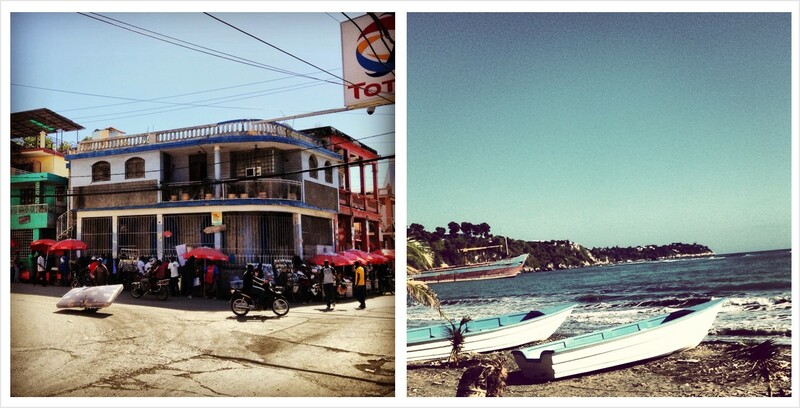 This is the typical Jacmel that we know and love. But I’m not a guy who likes to share these sorts of stories. They are the type of stories that give those damn State Department travel warnings fodder to continue to paint this country as savage and uncivilized. They’re the type of stories that support the stereotypes. But at the same time, the stories are true. But they don’t change just how much I love our otherwise quiet, peaceful, little region here in Jacmel or how much I fully appreciate the sometime silly warmth with which the people here normally receive people into their community and into their lives. Those stories don’t change the fact that I live in a place where I always feel safe, even last night. Those stories don’t change the fact that the vast majority of people in this community are not committing those violent acts. Those roadblocks and burning tires that I encountered last night really didn’t take many people to set up, just a few really angry (and probably slightly inebriated) ones. There were far more people trying to get away from the danger, trying to help people find ways around the crisis. There were far more people lifting their voices to advocate a better solution, and discourage the rioters from taking things so far. And yet, underneath it all, I think absolutely everyone understood those putting the rocks in the streets to some extent and saw the greater systematic injustices that were the real source of such unrest. Although all of us who were searching for safe roads might have preferred that the few others hadn’t set those tires aflame and blocked our way, it was difficult for any of us to really blame them either. And in this lies the paradox of what is Haiti. A beautiful, hospitable, passionate culture that fights for peace and justice, but fighting is the only way they see peace and justice possible sometimes. I couldn’t help but imagine what position I would be in if the 29-year old victim of this tragedy was one of my roommates that was viewed as not even important enough to slow down for, even tap the breaks or try to swerve. What fury would burn inside this peace-loving hippie if I was wanting to care for the body of a loved one but couldn’t because the callousness of the accident caused the body to be so broken that they couldn’t even find all of the pieces and some store manager had to scoop them up and hide them to prevent further violence? Would I be the one with the torch in my hand, yelling at anyone that could hear about my anger, and trying to do something, anything, to demand justice, no matter how nonsensical and in vain it might seem? If there’s one thing that the history of Haiti (and the world) has shown us, it’s that justice doesn’t happen on its own. It takes the action of human beings to perpetrate injustice and without the action of others to block injustice from speeding down its path, it will just continue unchallenged. What do you think? If the victim was a neighbor or friend of yours would you be searching for an exit or grabbing rocks and fanning the flames?